Cranston, Rhode Island USA ― AIM Solder, a leading global manufacturer of solder assembly materials for the electronics industry, is pleased to announce their upcoming attendance at IPC APEX EXPO 2019 taking place January 29-31, 2019 at the San Diego Convention Center in San Diego, California. AIM will highlight their revolutionary REL61™ and REL22™ lead-free solder alloys, along with their full line of solder assembly materials. REL61 is ideally suited for industries which require a cost effective alternative to SAC305 with no loss of processing performance or durability. REL61 provides significant advantages over other no/low silver alloys by offering better flow characteristics at lower temperatures, thus reducing PCB damage and assembly costs. Additionally, when combined with AIM’s award winning M8 solder paste, REL61 can lower peak reflow temperature and thermal exposure as well as improve aesthetics and solder joint performance. REL22 has been developed to address reliability and production quality issues common to similar multi-element alloys. Both internal and customer testing has proven that REL22 improves product survival in extreme thermal exposure operating environments such as under-hood automotive, avionics/aerospace and LED lighting. The physical characteristics of REL22 make it ideal for applications where thermal shock, vibration and g-forces as high 22,000g are experienced. Along with their REL products, AIM will also showcase its full line of advanced solder materials, including solder paste, liquid flux and solder alloys. 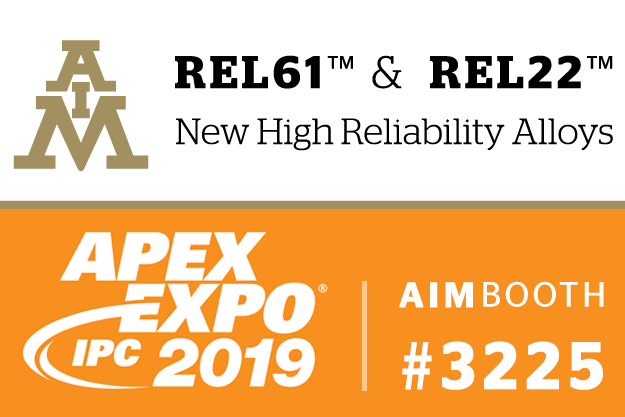 Visit AIM at IPC APEX EXPO 2019 in Booth # 3225 at the San Diego Convention Center, San Diego, CA for more information and to speak with one of AIM’s knowledgeable staff members.